Brighid tends the fertilized seed as it divides into life, grows full and journeys out toward the light and air from the watery furnace of the belly of the Mother. She is loved and worshipped throughout the Celtic world and is still honored as the healer goddess of the creative fire of life. On the Eve of Brighid’s Feast young Celtic women make corn dollies—woven effigies of Brighid called the Brídeóg—by weaving sheaves of corn or husks of wheat, barley or oats into the likeness of a woman. They often weave straw from the sheaves of the last harvest into the new one; continuity and blessings are intricately entwined with the golden crop that embodies the fertile fire of the sun. In parts of Wales the grain spirit was thought to hop from stalk to stalk as the sheaves were reaped, until she was in the very last sheaf, which was brought into the home, dressed and woven into the form of a woman. Sheltered for the winter, the corn or wheat spirit was then offered back to the land at planting time. These are the ancient rituals of an agrarian people, continuing from mother to daughter, from father to son through the rhythm of the years, keeping alive the balance of nature and connection between the farmers and the land, between the spirit and the earth. 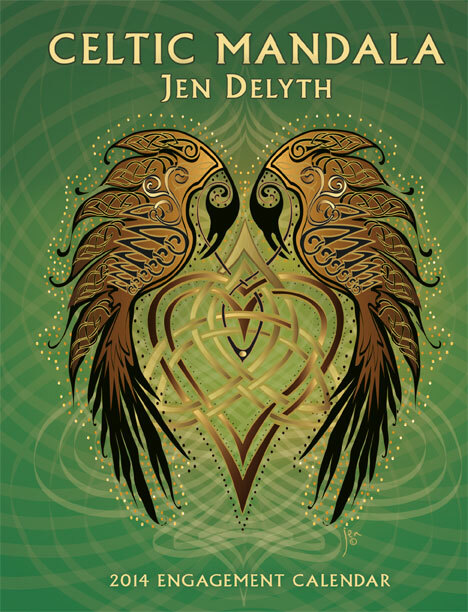 This entry was posted in Artist Spotlight, Celtic, Holiday Lore and tagged Celtic, Celtic Art, Embolc, Jen Delyth on January 30, 2013 by Amber Lotus Publishing.